NJSIAA investigation: Are wrestling referees enforcing hair rules properly? 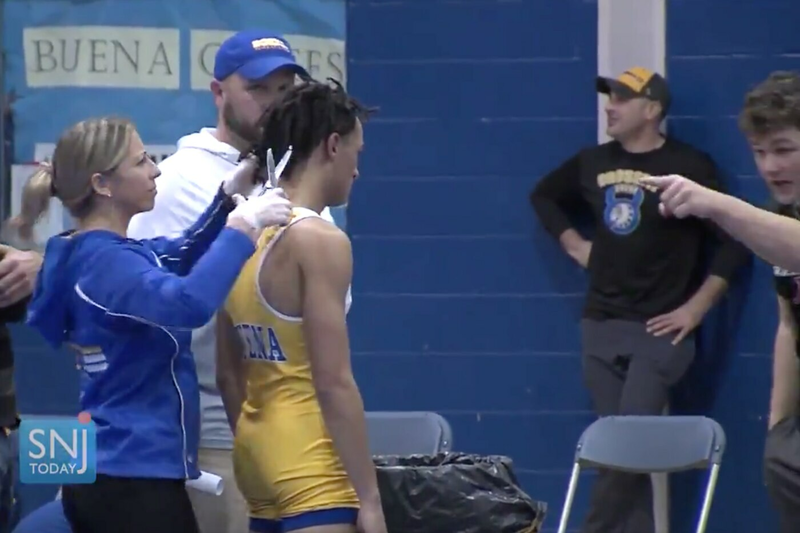 In a video captured by SJN Today News, Buena's Andrew Johnson stood stoically as his dreadlocks were shorn before he was allowed to compete against Oakcrest on Dec. 20. ROBBINSVILLE, N.J. — The New Jersey State Interscholastic Athletic Association is conducting its own investigation into the incident in which Buena wrestler Andrew Johnson’s dreadlocks were cut before he took the mat for a Dec. 19 match, officials said Wednesday. The investigation is running concurrently with a similar inquiry by the New Jersey Attorney General’s office, according to Steve Goodell, counsel for the NJSIAA. “We’ve turned it over to [the state attorney general’s office], and we’re investigating as well,” Goodell said after the NJSIAA’s monthly executive committee meeting at its headquarters in Robbinsville, Mercer County. NJSIAA officials have conducted interviews and continue to gather information about the incident, which sparked a social-media firestorm and led to the suspension of the referee at the match, Alan Maloney. Maloney’s interpretation of a rule that requires wrestlers with longer hair to wear a sanctioned cap that attaches to the headgear has been at the center of much of the controversy. NJSIAA executive director Larry White said his office has reached out to the National Federation of State High Schools Association (NFSHSA) office in Indianapolis for clarification of the rule. On Wednesday afternoon, the NJSIAA released a statement, saying that all member schools had been sent an official interpretation of NFSHSA wrestling Rule 4.2.1 regarding hair length. The document sent to member schools is an email from B. Elliott Hopkins, the national federation’s wrestling rules interpreter, to White. White said there was concern that some referees have not enforced the rule as strictly as Maloney did that night. In arguing with Maloney before Johnson’s match, Buena coaches claimed that Johnson had been permitted to wrestle the previous weekend without a sanctioned cap, according to a report by SJN Today News, which shot video of the incident. Attorney Dominic Speziali, who is representing the Johnson family, has said that Andrew Johnson was allowed to wrestle at the tournament the previous weekend without a sanctioned hair covering. White said he was concerned that the rule has not been uniformly enforced. “With any rule and with humans, there always can be one or two officials who say I’m not going to adjudicate the rule,” White said. White said the NJSIAA investigation should clarify whether the rule was properly enforced at Johnson’s previous match, which was Dec. 15 at a tournament at Southern High School. “Until we see all the reports, I can’t say whether it was enforced properly, whether it wasn’t enforced properly, or whether it slipped through the cracks,” White said. Under NFSHSA rules, during competition, “all wrestlers shall be clean shaven, with sideburns trimmed no lower than the earlobe level and hair trimmed and well-groomed,” according to the rule book. Howie O’Neill, a member of the Southern Chapter of the New Jersey Wrestling Officials Association and a director of the state tournament in Atlantic City, has said that Maloney followed proper procedure during the incident. “Alan did everything right,” O’Neill said. O’Neill said Maloney told Johnson he couldn’t wrestle without a proper hair cover and started a 90-second count during which time Johnson had to decide whether to forfeit the bout, get himself properly equipped, or have his hair cut. Buena superintendent David Cappuccio Jr. has said in a statement that no coach or school district official encouraged Johnson to cut his dreadlocks. A Buena trainer cut Johnson’s hair at the side of the mat. Johnson, a junior, won his 120-pound bout, 4-2, in overtime. “The student-athlete made the decision to have his hair cut at that moment in order to avoid a forfeiture of the match,” Cappuccio said in his statement. Johnson returned to the mat for the first time since the Dec. 19 incident for a round-robin meet Saturday at Williamstown. Buena was scheduled to host Absegami in a dual meet on Wednesday but the event was cancelled on Wednesday afternoon. Buena athletic director Dave Albertson said he was “not at liberty to discuss” the reason for the cancellation. White said Wednesday that NJSIAA associate director Bill Bruno, who oversees wrestling for the sport, has led the organization’s investigation. Bruno was out of town Wednesday and unavailable for comment. Goodell said the decision to forward information on the incident to the Attorney General’s office was made because news reports portrayed the incident as a potential example of racial bias. Maloney is white and was involved in an incident in 2016 in which he was alleged to have used a racial slur. Johnson is biracial. Staff writer Melanie Burney contributed to this report.